Today the site is calm; a place for reflection. Old Glory flaps in the wind, water laps at pilings that once supported a pier, light filters through tree branches onto the remnant of a ship and four smooth granite pedestals present 320 etched names. The scene was different the evening of July 17, 1944. This is the site of the United States’ largest homeland disaster of World War II—the Port Chicago explosion. Here, African American enlisted men, under orders from officers, loaded munitions onto waiting ships. The enlisted men were led to believe that the munitions had no detonators and were, therefore, harmless. This was not the case, and 5,000 tons of explosives ripped through two ammunition ships, ammunition-laden boxcars, and a Navy pier, disintegrating most and turning the rest into so much rubble. Hundreds were killed and injured that Monday night – accounting for 15 percent of African American casualties in World War II. 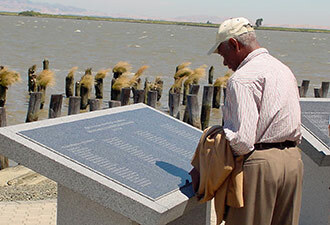 Port Chicago Naval Magazine National Memorial, the country’s newest national park, 30 miles east of San Francisco, commemorates lives that were lost here and serves as a platform to learn about injustice, civil rights, and the desegregation of the United States military following the disaster. At the waterfront memorial, in addition to the granite pedestals that preserve the names of those who died in service to their country, you can see the site and learn how it relates to the historic appearance and functions of the naval magazine. 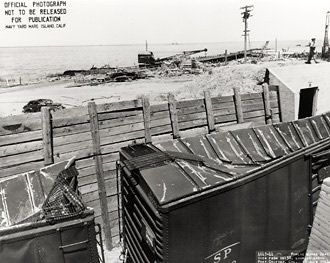 National Park Rangers teach about the workforce involved in loading ammunition, the segregation under which the military operated, and the aftermath of this explosion. Here people try to understand and come to terms with what is practically incomprehensible – the massive force of the explosion and the tragic deaths. The park is located within Military Ocean Terminal Concord. This active U.S. Army port is home to a great variety of plant, bird, and animal life, which you may observe on your ride (provided by the National Park Service) to and from the memorial. Prepare for a unique visit – because this is an active military site you must request “your orders” to tour the site at least two weeks in advance, so we can make appropriate arrangements to ensure that we do not interfere with Army operations. On Saturday, July 17 join the National Park Service and the United States Army for an event to remember those who lost their lives in the Port Chicago explosion. Sailors, known as survivors, who were not on duty that night, family members, and military and civic officials gather to share memories and witness a wreath throwing. If you wish to tour the Port Chicago Naval Magazine National Memorial or attend the annual commemoration, please contact the National Park Service by visiting the park’s website or by calling (925) 228-8860. We would be honored to share with you this pivotal point in American history. 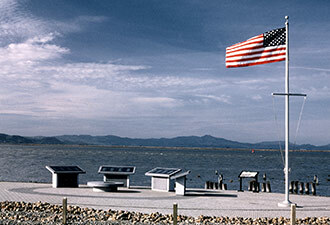 To learn about or visit other World War II sites in the San Francisco Bay area, check out the National Register of Historic Places’ World War II Travel Itinerary.